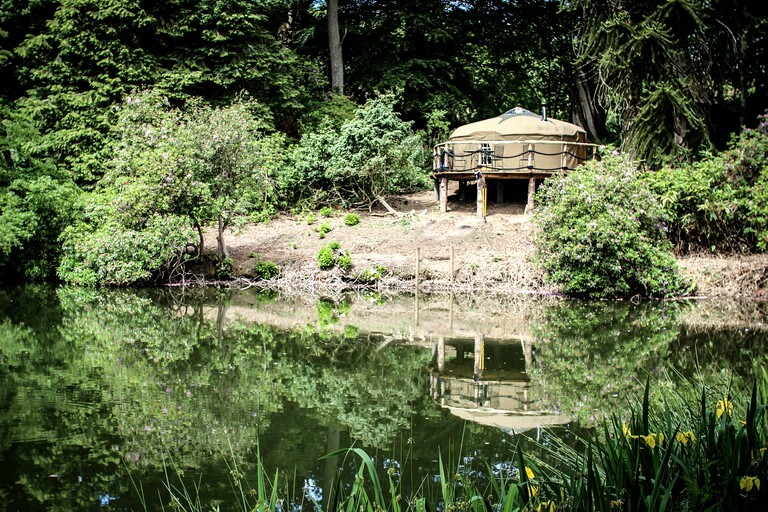 This picturesque yurt rental near Shrewsbury, England, is set by one of the two natural pools on the site. Glampers staying here also have their own rowing boat so that they can enjoy the water. 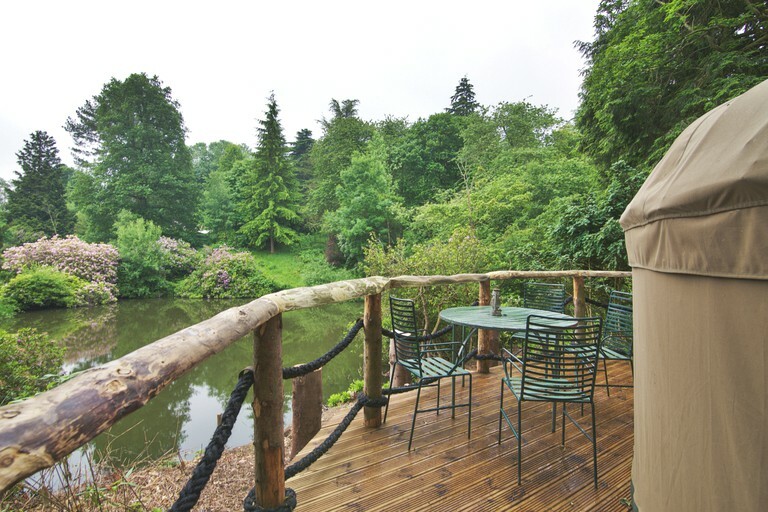 With stunning views, guests can enjoy the decking with plenty of room for sitting out and enjoying a morning coffee or an evening drink. 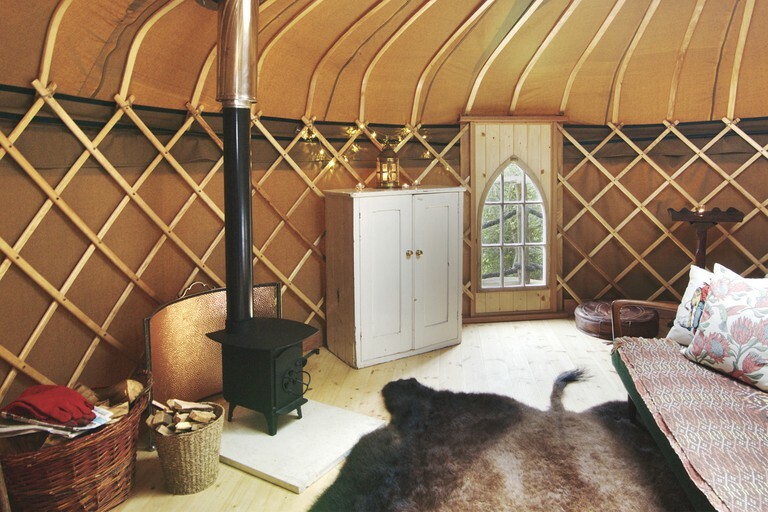 The yurt has a double bed and a double sofa bed, as well as a wood-burning stove, a two-ring gas cooker, and a cooking area with a table and four chairs. All guests have access to the stunning grounds that include a lake, two natural pools, and an Arboretum. The pools have rowing boats and fishing facilities as well. 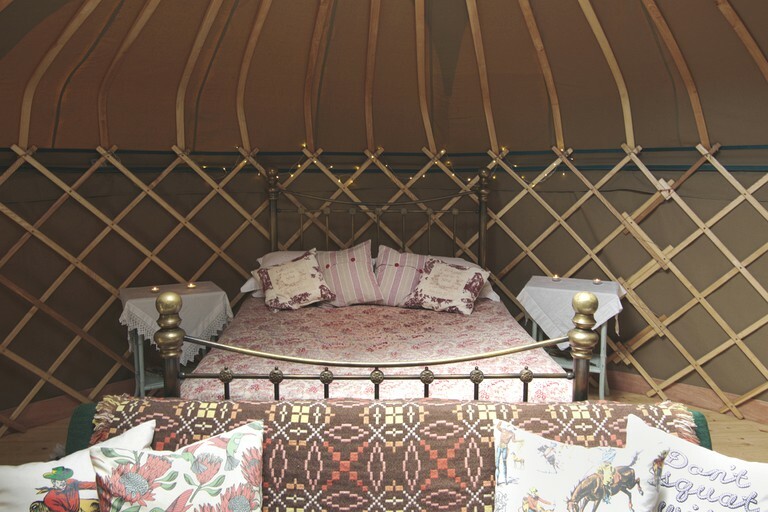 Guests staying in yurts and caravans have access to a shared gas-powered shower in a caravan central to the Arboretum. 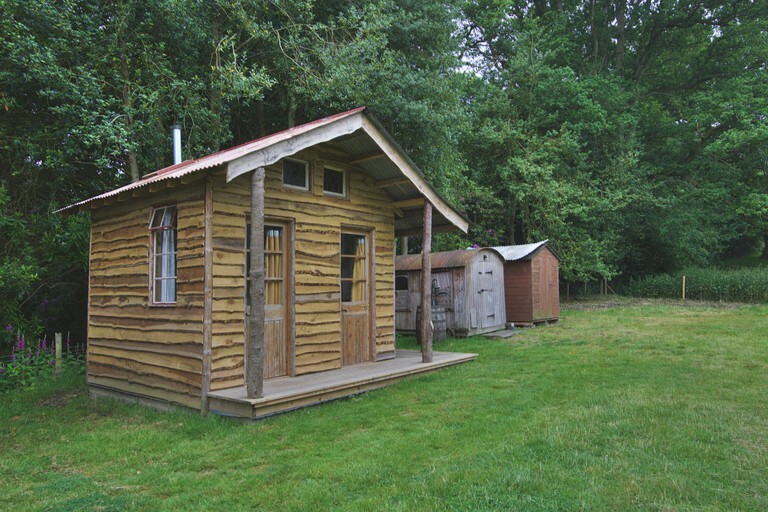 There is also a facilities block available to use at the nearby campsite which is owned by the same host. Towels are not provided in these accommodations. There are numerous outdoor activities available in the Shropshire Hills. Glampers can go rafting and canoeing or, alternatively, experience the county from the sky in a hot air balloon with Virgin Balloon Flights. The Shropshire Hills are perfect for hikes and experiencing the English countryside. There are numerous museums and historical sites in the surrounding towns and villages, such as Stokesay Castle. 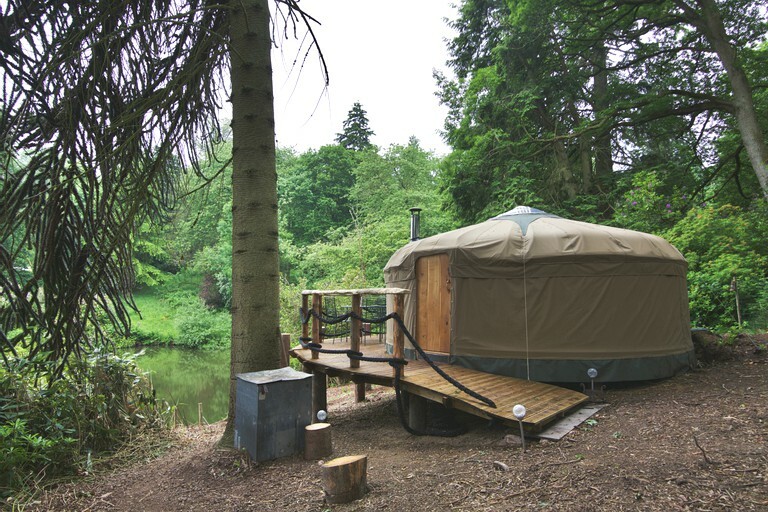 Glampers can explore the beautiful town of Shrewsbury, historic Worcester, and visit the vibrant city of Birmingham. 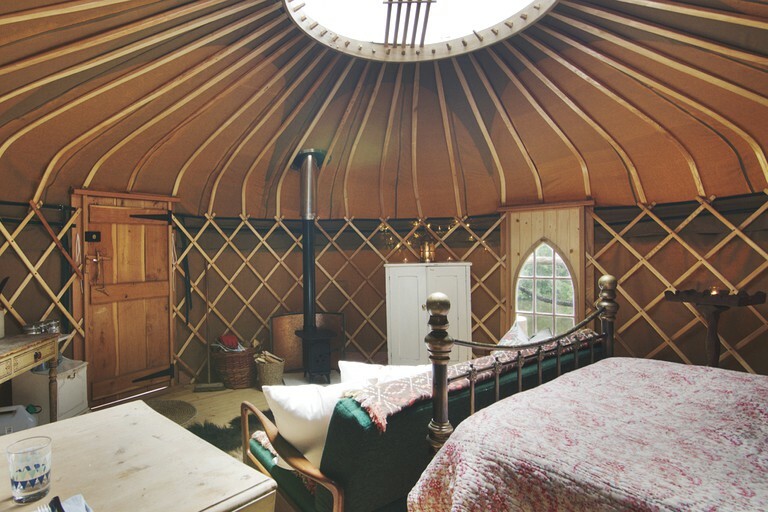 There are also a lot of activities that guests can do at the glamping site. There are two secluded pools which are perfect for fishing. Guests can take out one of the rowing boats on the large lake on the property. The Arboretum is a beautiful place to explore for its natural beauty and wildlife. In the evenings, guests can get a taste of one Britain’s greatest traditions; an ale from the local brewery and delicious food served at the local pub. Weekend breaks are for two nights on either a Friday and Saturday night or Saturday and Sunday night. Mid-week breaks are for four nights from Monday-Friday. Weekly stays are also available, but please note that at Christmas, New Year, and Easter, all bookings are for a minimum of seven nights.